The observance of Spiritual Shouter Baptist Liberation Day stands as one of the most colourful and inspiring reminders of the powerful force unity creates when we stand, work and struggle together in the face of all odds. Today we are just short of a century since the Shouters Prohibition Ordinance was passed on November 16, 1917. The reason for the ordinance was as unjust then as it is unjust in our minds today – that the Shouters made too much noise and disturbed the peace. 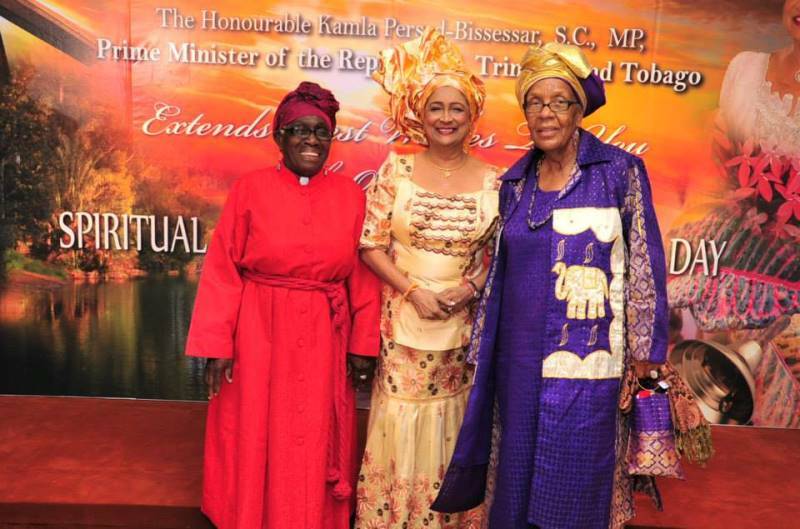 It was therefore a defining moment when Archbishop Barbara Burke quoted Psalm 100:1 of the King James Bible: “Make a joyful noise unto the Lord, all ye lands” when on 26 January 1996, Spiritual Shouter Baptist Liberation was declared a public holiday of national significance by the Basdeo Panday Administration. For all of us, it was a moment of profound poetic justice, where we all joined hands and finally broke the last remaining chains of the trauma and torment of past struggles for liberation as a people, and freedom as citizens of Trinidad and Tobago. The Spiritual Shouter Baptist community has made an indelible mark on the rich heritage that we proudly celebrate. It was in 1812 that the journey started in Trinidad and Tobago when the ‘Merikens’ —former American slaves recruited by the British to fight – came to our land. Back then, one might hardly have considered the deep and enduring contribution the community would make. One of our most celebrated Labour Leaders, Tubal Uriah Butler, was a High Priest and Leader of the faith who no doubt found his strength and resilience in a strong spiritual grounding. The Trinidad Village, a 1949 study of our region by Anthropologists Melville and Frances Herskovits, was inspired by the Spiritual Shouter Baptist community. Earl Lovelace’s masterpiece, The Wine of Astonishment was based on the Spiritual Shouter Baptist struggle. Calypsonian Superblue’s 1991 Road March Get Something and Wave was based on a Baptist woman’s, Mother Muriel’s, vision and belief that our nation would rise again following the attempted coup the year before. It is for these and so many other significant reasons, that the Panday Administration made today’s commemoration a day of national importance. It is also for these strongly inspiring cultural reasons that the UNC/People’s Partnership Administration made a commitment and delivered State supported education and teaching facilities for children and young people of the faith in March of 2015. So today, as we celebrate the triumph of a long and agonizing struggle, let us remember the kind of fortitude and resilience upon which our citizenship is built, which define us as a people. I send my most heartfelt wishes for a happy and holy celebration to the Spiritual Shouter Baptist community, and to all citizens of Trinidad and Tobago.